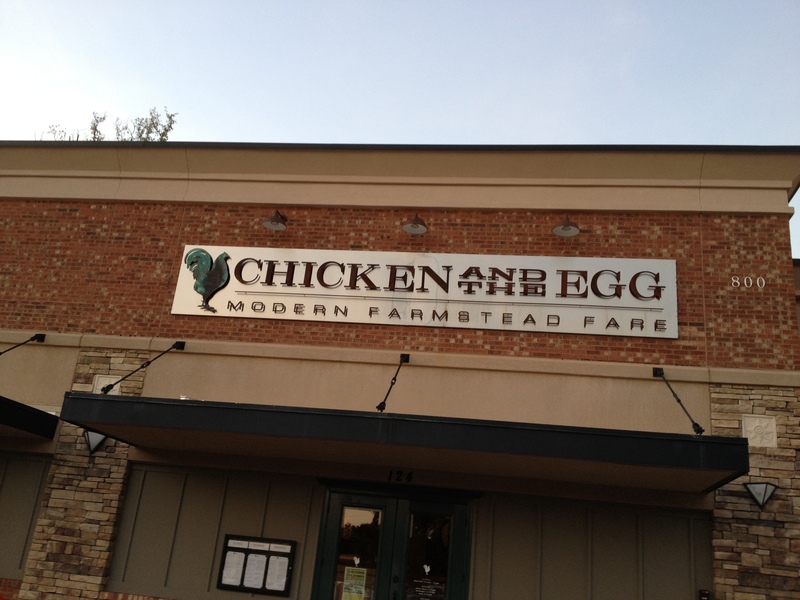 Tonight Date Night tries to answer the ages-old question of which came first, the chicken or the egg. We are about a mile west of the Marietta square in a nondescript shopping center that holds a restaurant that’s always popping up on those “Best of Atlanta” lists in the “old media”, newspapers and magazines. Full disclosure time: we are here on a Wednesday this week because it’s this correspondent’s birthday. Although it looks empty in the pictures, the restaurant is quite busy and all of the booths around the edge of the space are full. It’s busier than it looks for a Wednesday night. It’s a large seating area and the bar is just as big. There is a large menu of mixed cocktails, but of course we go for the beer. 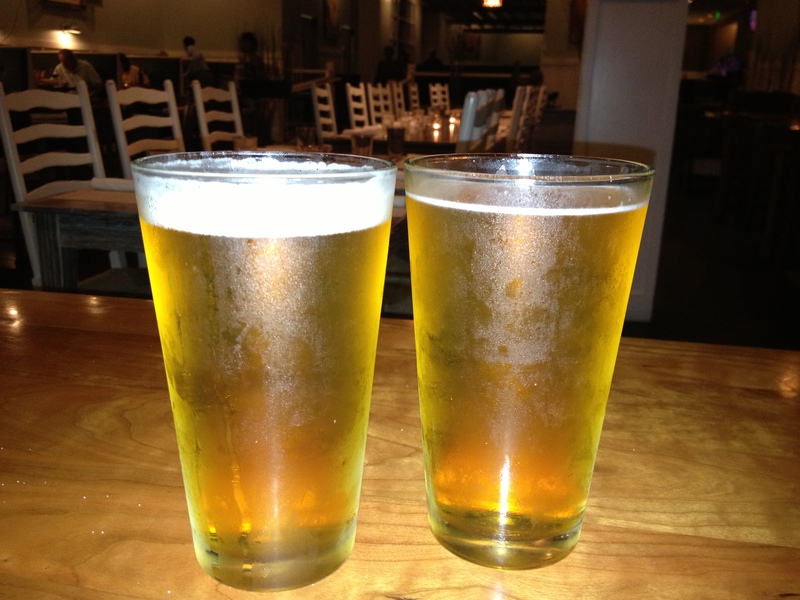 We both get the same thing, the Abita Andygator on tap. A nice, smooth doppelbock with 8% alcohol. We served this beer at a party once, and what a party it was. Don’t let the light color fool you, this gator packs a bite with that 8% alcohol. Date Night was very relaxed after a few sips. We’re hungry, and order the appetizer. 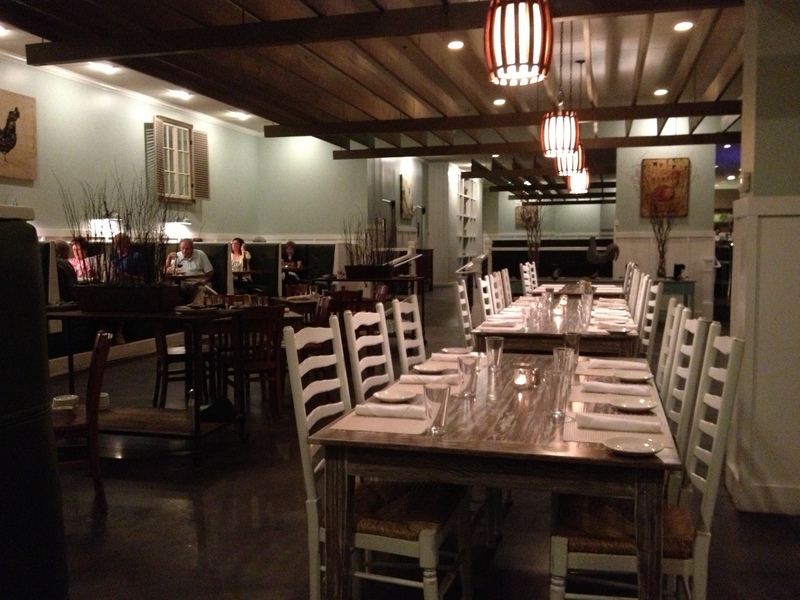 The menu features “new southern” fare as well as old-school southern. We go “new-school” and get the black-eyed pea hummus. 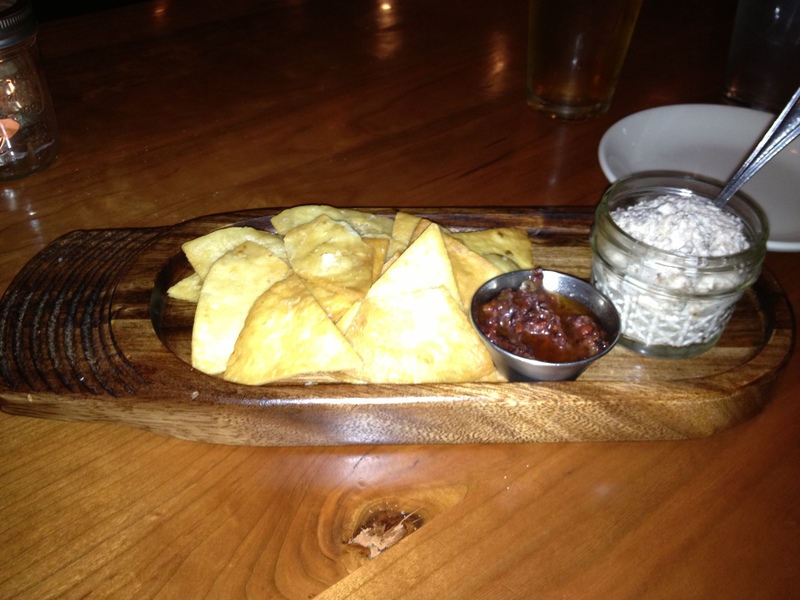 It comes with a yummy olive tapanade and crispy, crunchy pita bread. None of it lasts very long on the nicely-presented plate. 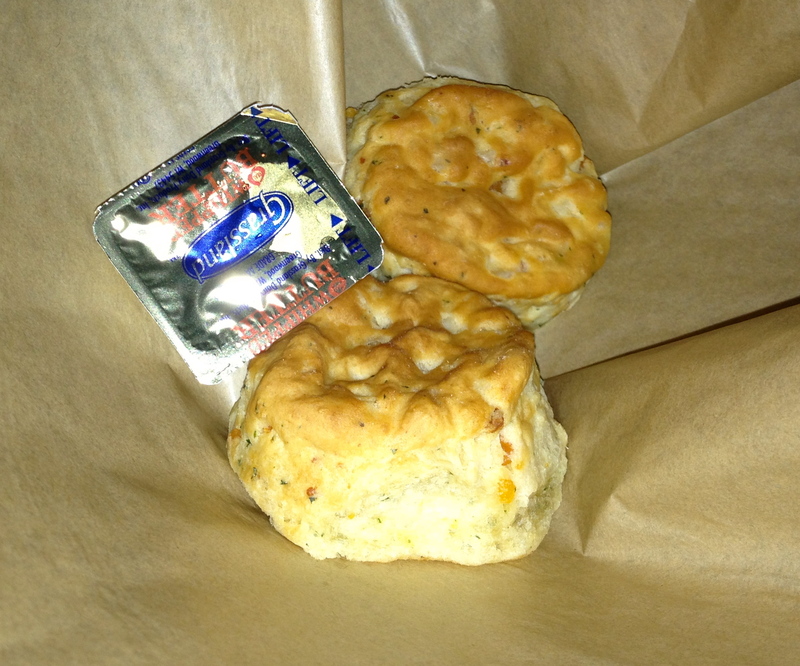 Between courses we are brought two warm, steaming biscuits. They have corn and a bit of pepper in them and they are delicious. I eat fried chicken about once every six months, so when I eat fried chicken, I want it to be memorable. Our waitress tells us that the fried chicken is the house specialty, so I order the chicken and waffles. Chicken and waffles. Uptown soul food. Chicken and waffles is a recent soul food trend, and it’s very popular intown. This chicken is amazing and is some of the best I have ever had. The skin is crisp and crunchy and the meat inside is moist and tender. The waffles are also loaded with flavor. This is a must-have dish when you eat here. 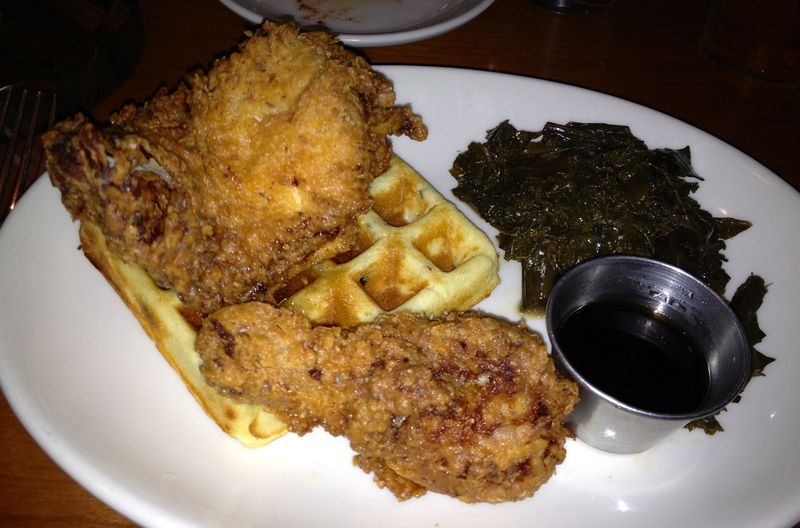 The waffles and the collard greens go perfectly with the wonderful fried chicken. 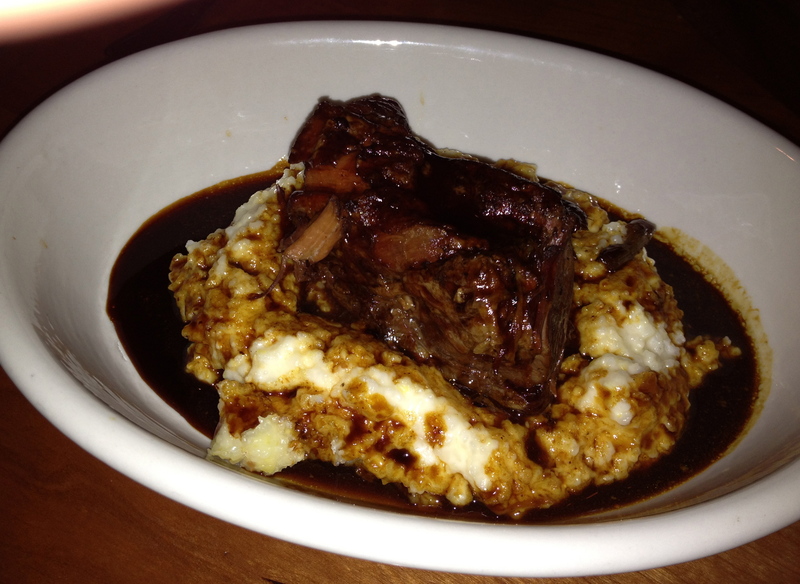 Eve stays with the new southern trend and gets the short ribs. Short ribs are filled with flavor. It’s one very meaty rib on a bed of cheese grits. We shared dishes, and hers was excellent, but for once, mine was much better. It’s a birthday celebration, and we go for broke on dessert. 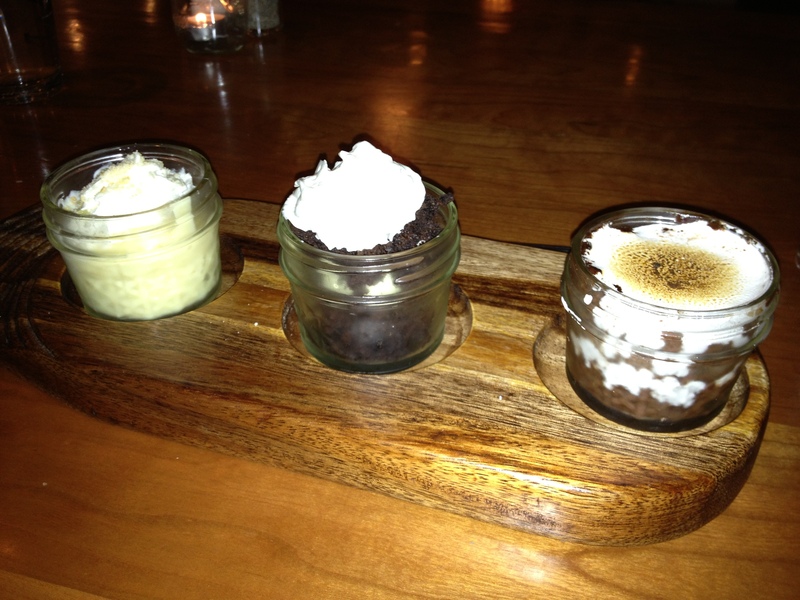 You can order up to four desserts, which change nightly and are served in these cute little jars. We want all of our desserts served like this from now on. We restrain ourselves and only order three, which turn out to be the perfect ending to our meal. From left to right you have banana pudding, white chocolate mint cake, and s’mores. The s’mores is the best of the three with melted marshmallow atop a chocolate-graham cracker mixture. We want some more as we try to figure out how to lick out the jars. So which came first, the chicken or the egg? With a fried chicken recipe like this, definitely the chicken. Chicken and the Egg lives up to it’s hype. It’s worth the trip outside the perimeter, or if you are already in Marietta, make sure you get there. They do brunch on the weekends, so check it out the next time you are looking for a fantastic meal in the suburbs.